You lose weight by burning more calories than you eat. If you exercise several hours per day you can eat a lot more than 1,600 calories a day and still lose weight. In fact, someone who exercises a lot needs to eat more calories to have the energy to exercise that much in the first place. Losing weight while eating 1,600 calories a day is a lot easier because it requires very little activity. Calories are a measurement of energy needed for survival. 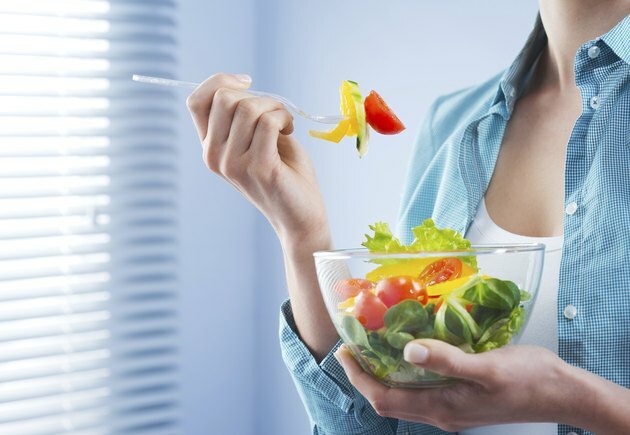 The average woman needs to eat about 1,100 calories a day and the average man needs to eat about 1,300 to ensure that their heart, lungs and other internal organs are functioning properly, according to the college textbook, "Health and Wellness." Authors Gordon Edlin and Eric Golanty also report that diets almost never work with 95 percent of dieters regaining their lost weight within five years. In addition, cutting calories without exercising reduces your metabolism -- your ability to burn calories via all activities -- because you lose muscle when you lose weight without exercising and muscle burns more calories than fat. You lose 1 lb. when you burn 3,500 calories and burn calories throughout the day. Sleeping burns 46 calories per hour in 155-lb. people, while watching television burns 56, according to Harvard Heart Letter. Heavier people burn more calories. Active people burn more calories than sedentary people. For example, 155-lb. people burn 260 calories per hour doing carpentry work and 112 calories per hour doing light office work. A 155-lb. person who sleeps eight hours, watches television for eight hours and does eight hours of light office work burns 1,712 calories. This individual can lose weight eating 1,600 calories a day, but might have fatigue problems because "The Merck Manual of Medical Information" reports that sedentary men need about 2,000 calories a day, while sedentary women need about 1,600. People with sedentary jobs can lose a lot of weight eating 1,600 calories daily by making lifestyle changes. The Complete Guide to Walking reports that 21st century Americans burn about 650 fewer calories a day on "routine tasks" than 1980s Americans. Light-office workers who weigh 155 lbs. can burn 2,398 calories daily by playing with their children for one hour, gardening for one hour and cleaning for one hour daily, while cutting their television watching from eight to five hours daily. Playing with your children, gardening and cleaning burn 298, 334 and 334 calories per hour, respectively. You can lose even more weight if you exercise. Walking 3.5 mph for two hours burns 596 calories. Golfing while carrying your clubs for two hours burns 820 calories. Light-office workers who weigh 155 lbs. can burn 2,904 calories daily by walking and golfing for four hours instead of watching television. Burning 2,904 calories and eating 1,600 calories daily means you will lose 1,304 calories daily or 2.6 lbs. weekly. However, you might be fatigued if you eat 1,600 calories daily while you're exercising so much because active women and men should eat 2,000 and 2,400 calories daily, respectively, according to The Merck Manual. How Much Exercise Per Day to Lose Weight?